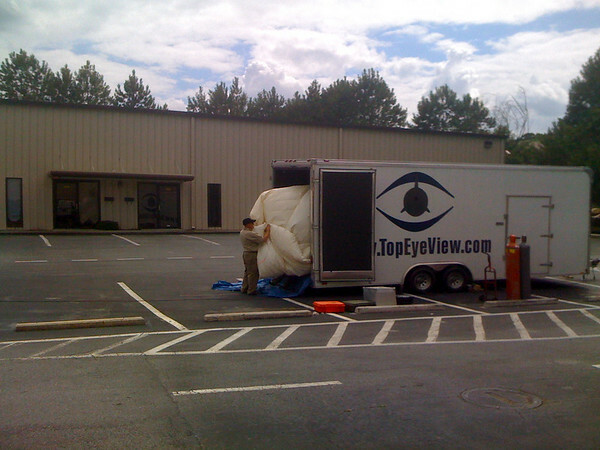 Out of the truck comes a partially-inflated blimp. You can get an idea of the scale from the pictures above. You can’t ride it, but it can carry a few dozen pounds of useful payload. In this case, a gyroscopically-stabilized broadcast-quality video camera. Click on the photograph above for a better view: there’s a pair of nylon ropes stretching up to the blimp, which is hovering at 450 feet. (TopEyeView has been cleared by the FAA to operate up to 500 feet just about anywhere in the U.S. that’s not near an active runway.) A wireless transmitter on the blimp shoots the video signal down to the control station; the line-of-sight ground antenna is about the size of a big hardback book. The flight director sits at a portable control station where he controls the camera with a joystick. He can zoom in and out, pan up and down, and rotate it 360°. The blimp acts like a huge weathervane, so if you’re filming a static target (like a concert stage), the director has to manually keep the camera aimed in the right direction. That job will belong to software in a future version. The zoom is incredible. The image above is of a baseball field three miles from our parking lot. (All I had was my iPhone camera; it looks a lot better than this photograph implies.) Keeping the image stable was no problem, and the quality was clearly good enough to put on the national news. When you’re done, you let out some of the helium, winch it down, and stuff the partially-inflated blimp back into the truck. Television news stations, obviously. It would have been riveting to have one of these filming from 500 feet up, a quarter mile away from the burning Georgia Theatre this morning. Concert and festival promoters. 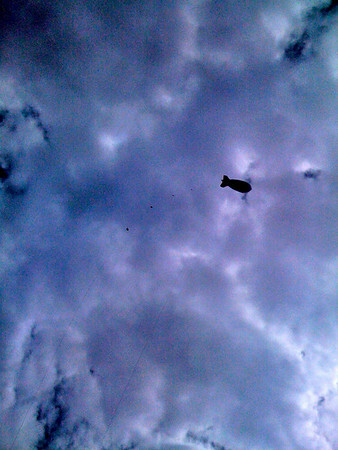 That’s a twofer… a security “eye in the sky” during the event, and top-quality video footage to be used for the TV special or DVD later. The Border Patrol. The Secret Service. Greenpeace (what’s really going on on the other side of that factory fence?). The list goes on. 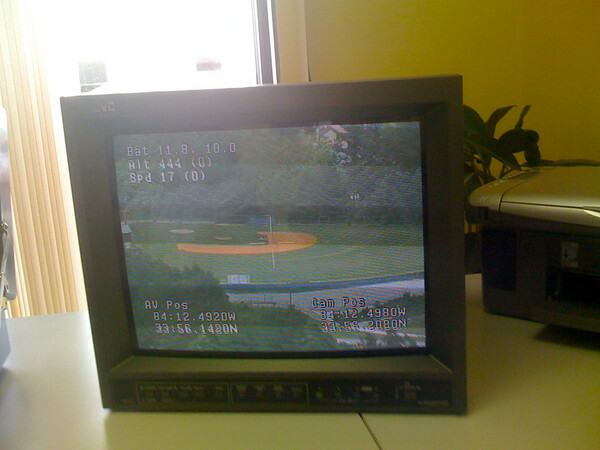 TopEyeView provides the same quality video that you’d get from a broadcast-equipped helicopter. 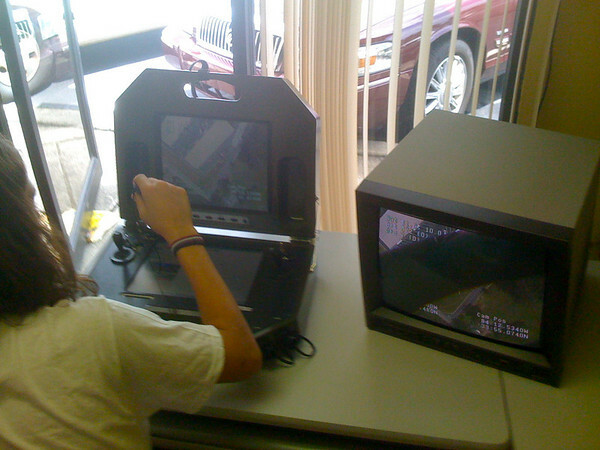 But you can use it to silently observe your event from the sky all day long for just a few thousand bucks. A helicopter plus a pilot will run you tens of thousands of dollars per deployment, plus they make a hellacious racket, plus they can’t fly low over crowds, plus they can only stay on station for a limited time until their fuel runs out. UAVs like this Georgia Tech spin-out are stealthier and quicker to deploy—handy for your local SWAT team!—but can’t provide the staying power (“loiter time”) or crowd appeal of a blimp. Tamir and TopEyeView have done all the right things… built a working prototype, gotten some early customers, navigated the FAA’s regulatory path, and are—if you’ll pardon the pun—ready for takeoff. 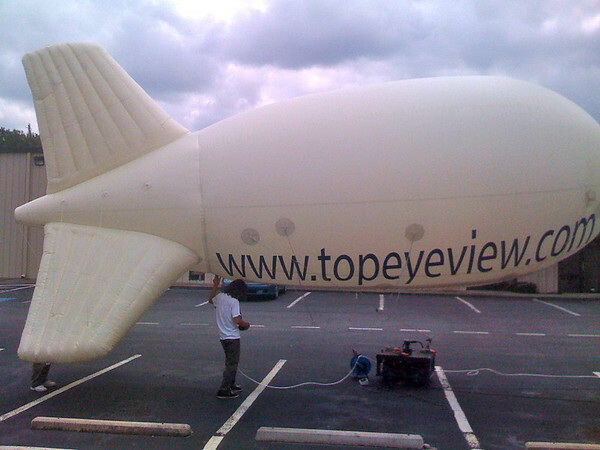 The next step is to upgrade the blimp to transmit HD video, so they’re looking for investment. I met then through Space Angels Network, one of the investment groups I participate in. If you’re interested in more information (on the company or on Space Angels Network), drop me an email. It’s refreshing to see an old concept thoroughly reworked with modern technology. And this demonstrates one of the strengths of Atlanta’s entrepreneurial community... we’re not all Web 2.0 developers (although we’re good at that). We’re aerospace, and materials science, and semiconductors, and telecomm, and medical devices, and vaccines, and solar cells, and biofuels, and Lord knows what we’ll see next. Amid all the economic doom and gloom, Tamir is a reminder that it’s a great time to be an entrepreneur in Atlanta! I’ve known Tamir for awhile and while I’m no aerospace expert, the business seems intriguing. I hope the investment community will give him and his company a serious look. Why the reference to Plano football? Curious since I am an Alum. They would love this for high school football. We are working with the Rome News Tribune and they are up for an broadcast TV award for their high school football show. Interesting market.